National Coming Out Day ! New Hope Celebrates is celebrating National Coming Out Day on Thursday, October 11, 2018 with a video campaign to provide support and a venue for LGBTQ+ people and allies to come out. 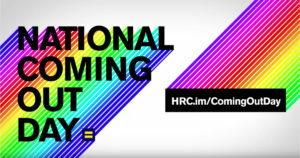 Please post your video and use the hashtags: #OUTinNewHope #iamnewhope #HRC #NationalComingOutDay You can also post images using these hashtags. Express yourself anyway you choose! We will be sharing and reposting stories throughout the day. On Oct. 11, 1987, half a million people participated in the March on Washington for Lesbian and Gay Rights. It was the second such demonstration in our nation’s capital and resulted in the founding of a number of LGBTQ organizations, including the National Latino/a Gay & Lesbian Organization (LLEGÓ) and AT&T’s LGBTQ employee group, LEAGUE. The momentum continued four months after this extraordinary march as more than 100 lesbian, gay, bisexual, transgender, and queer activists from around the country gathered in Manassas, Va., about 25 miles outside Washington, D.C. Recognizing that the LGBTQ community often reacted defensively to anti-LGBTQ actions, they came up with the idea of a national day to celebrate coming out and chose the anniversary of that second march on Washington to mark it. The originators of the idea were Rob Eichberg, a founder of the personal growth workshop, The Experience, and Jean O’Leary, then head of National Gay Rights Advocates. From this idea the National Coming Out Day was born.